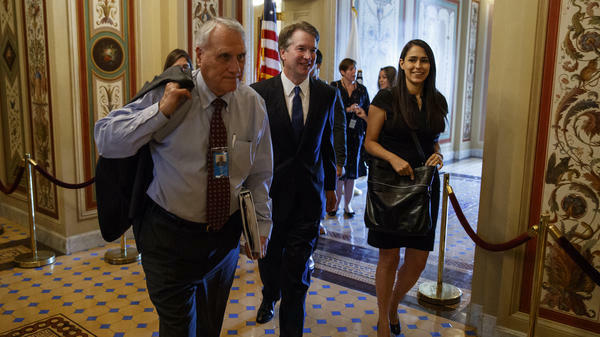 Former Sen. Jon Kyl has been shepherding Supreme Court nominee Brett Kavanaugh through the Senate. Kyl will return to the chamber, succeeding the late John McCain. Former Republican Sen. Jon Kyl has been tapped to replace the late Sen. John McCain in the Senate. Kyl, 76, served three terms in the Senate, rising to become the No. 2 Republican before retiring in 2013. He has been helping guide Supreme Court nominee Brett Kavanaugh through the Senate and has been a lobbyist at a Washington law firm. He also previously served in the U.S. House. In making the announcement, Arizona Gov. Doug Ducey, a Republican, said "there is no one in Arizona with the stature of Sen. Jon Kyl" and that he is "prepared to hit the ground running." A source close to Ducey told NPR "there are weighty things transpiring in Congress and there is no one better to deal with them than Jon Kyl." Kyl will serve through the remainder of this year and will be able to vote on Kavanaugh's nomination. Ducey said he hopes he will serve longer. Kyl, though, would not commit Tuesday to staying beyond this term of Congress, saying, "I do know I will not seek this seat in 2020 nor any other office in the future." Kyl said he decided to return to the Senate because of his sense of duty "to the state I love," adding, "I'm putting my country first just as this seat's previous occupant did every single day." McCain, who died of brain cancer on Aug. 25, was last re-elected in 2016; his term will expire in 2022. The appointment was tweeted by McCain's widow, Cindy. "Jon Kyl is a dear friend of mine and John's," she tweeted. "It's a great tribute to John that he is prepared to go back into public service to help the state of Arizona." Ducey said Kyl was "an expert on the matters facing Arizona," including water, land use and issues involving Native Americans. Kyl said he did not "really have a relationship" with President Trump, having met him only once. But he is likely to be a reliable Republican vote in the final months of Congress which, along with the Kavanaugh nomination, could bring myriad spending issues, and the possibility of a government shutdown.